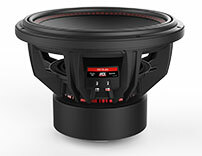 Most car audio enthusiasts (bass heads) start shopping for their new system once they have decided the quantity and size of subwoofers they want to buy. After all, for bass heads, subwoofers are the main part of the system that creates the window rattling, body-panel-flexing bass they crave! But a common mistake when choosing subwoofers is the assumption that the higher the rated power handling, the louder it will sound. This is perfectly logical, but not always true. To understand, you need to know what makes a subwoofer loud (SPL) and some basic physics. Now, don't expect this post to be a science lesson with a bunch of technical equations and diagrams. This is a basic explanation of SPL and subwoofer power handling. Peak Power Handling = A measure of power that could potentially be managed for short bursts. XMax = The distance a subwoofer voice coil can move in one direction without leaving the magnetic zone a.k.a. how far the woofer can move. It's important to also understand that some car audio manufacturers promote ridiculously crazy Peak Power ratings as a marketing tactic to get customers to believe their product will be louder, better, more powerful, etc. However, the crazy math calculations they use to come up with these numbers are not realistic. Sound is created by vibration of an object. The vibrating object causes air molecules nearby to move back and forth in sound waves. The more air molecules you move, the louder your sound waves will be. The more air molecules you move within the interior cabin of your vehicle, the more air pressure you will create. This is called sound pressure. The Sound Pressure Level (SPL) is the measurement of this pressure in decibels. So without going into too much detail, the moral of the story is, the more air you move, the louder it will sound. So buy a bunch of 18" woofers and you will be loud. Right? Not necessarily. There are plenty of other factors to consider. An 18" woofer has a lot of surface area, but can the woofer move a lot of air? This is where XMax comes in. If the 18" woofer can only move one 1/16th of an inch, it's not going to move much air. It is similar to sending a higher frequency tone to a woofer. It's not going to move much and it won't be very loud. So what does it take to get a woofer to have a decent Xmax you might ask? Well… A lot! It takes a good suspension that can handle the movement while maintaining linearity. If a subwoofer does not stay linear in it's movement, it will create distortion and can even cause a rub or short of the voice coil against the pole piece. Simply put, a good quality suspension is very important. In order to have good XMax, you also need a strong magnetic field which uses AC current to push the woofer forward (positive) and pull the woofer backward (negative). This magnetic field is created using the magnets on the woofer's motor structure and the electrical current being transferred through the voice coil. So here is where most people make a logical assumption that isn't necessarily true. Logic would tell you the bigger the magnet, the bigger the magnetic field. The more power through the voice coil, the more XMax you will have. The more XMax you have, the louder you will be. Right? Not necessarily. I can build you a woofer with HUGE magnets weighing 200lbs and a voice coil that is capable of handling 10,000 watts. That's easy. But designing a suspension that can keep that power under control is the hard part. If the suspension is so tight and rigid to control the power, it will limit the XMax. If the suspension can't control the power, the subwoofer could become non-linear causing distortion and even burn the voice coil and now your 10,000 watt subwoofer is a 200lb paper weight. Additionally, we haven't talked at all about mass yet. Consider this. Subwoofer A has a power handling rating of 2,000 watts with huge magnets hanging off the back and a cone assembly made of aluminum that has a mass twice that of the cone assembly of Subwoofer B which has a power handling of 500 watts with magnets half the size. Which subwoofer has the potential to be louder? If you understand this information, this is a trick question. You can't determine which subwoofer could be louder from this information only. Subwoofer A can take more power but it's cone assembly is heavier and therefore it takes more power to move it. Xmax could suffer as a result. Subwoofer B can't take as much power but it's cone assembly is lighter and therefore, it's XMax could be as good or better than Subwoofer A thus moving more air. It's called efficiency. After all, we don't want to spend the extra money for a HUGE amp or tax our vehicle's electrical system to power it if we don't have to. Right? So the point is… comparing the performance of subwoofers purely based on the power handling rating is not always a fair comparison. There are too many other factors to consider. And once you make your purchase and start the installation, there are even more factors to consider to ensure your subwoofer(s) performs to it's maximum potential such as enclosure design and port size and length for tuning. Plus if you buy a subwoofer with an RMS power handling rating of 2,000 watts, you are going to want to put 2,000 watts to it. Under powering a subwoofer is often times worse for it than over powering. Then you have to make sure your vehicles electrical system can support a 2,000 watt amplifier. Not to mention a 2,000 watt amplifier (that truly does 2,000 watts RMS) will cost you more than one that does 500 watts assuming they are of comparable quality. Car Subwoofers: SPL or SQ?